n 1 a: Natural paper-like eco-textile from the South Pacific created from beating the inner bark of a mulberry tree. b: Paper-like in texture, the fabric is colored with natural dyes and painted with tribal designs and then used as decorations, wall-hangings, and even wedding and ceremonial costumes. c: Native cultures in Fiji, Tonga, Samoa, and other Polynesian islands still hand-make tapa and use it in their everyday life, and some designers now are even using the textile to create more traditional clothing. In the South Pacific, women scrape out the inner bark of the mulberry tree and patiently spend hours beating the bark to make a beautiful eco-textile called tapa. Paper-like in texture, the fabric is colored with natural dyes and painted with tribal designs and then used as decorations, wall-hangings, and even wedding and ceremonial costumes. Native cultures in Fiji, Tonga, Samoa, and other Polynesian islands still hand make the cloth and use it in their everyday life, and some designers now are even using the textile to create more traditional clothing. Tapa cloth is made from the bark of the mulberry tree by beating the bark until thin. It is then stained and painted with natural dyes. Here, islanders from the South Pacific are stripping the mulberry tree branches of their bark and taking the white inner bark to create the eco-textile. The beaten layers of bark are combined to create large pieces of fabric that are painted on with traditional patterns and motifs. 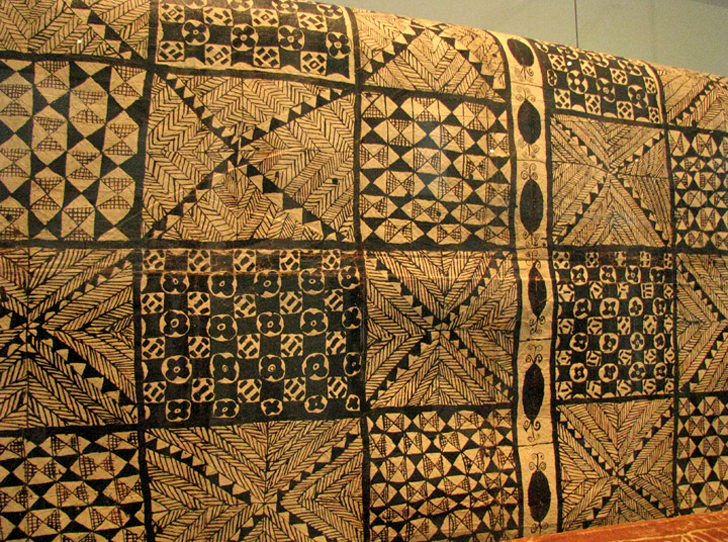 Women are traditionally the crafters of this beautiful eco-textile, which is found in most islands in the South Pacific. Sometimes the women gather in large groups to fashion a large piece of tapa together, much like a Western quilting bee. Women now use discarded X-ray film to create the stencils in order to paint the intricate patterns and motifs. Natural dyes and paints are made from the plants, mangrove water, and ash to create the brown, red, and black colors. An exhibit at the Fiji Museum in Suva features a beautiful collection of modern tapa wedding gowns. The gowns are an example of using traditional tapa fabric in new and modern ways. Beads, shells, and other handwoven fibers are used to embellish these natural gowns. More-traditional wedding ceremonial costumes involve wrapping the fabric around the person's body. The fabric is stiff like paper and must be bent and cut. Although durable under normal conditions, it lose stability when wet. Each layer in these historical multitiered gowns has its own pattern and motif.